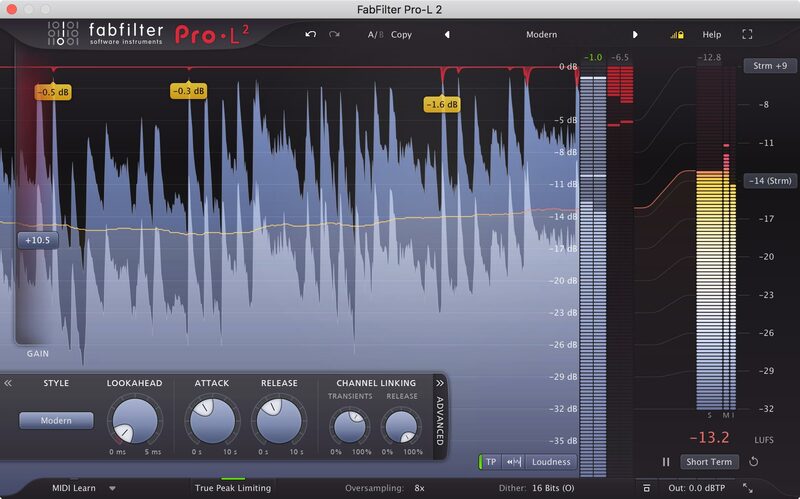 With eight highly advanced algorithms, true peak limiting, linear-phase oversampling, professional dithering and noise shaping and surround support (up to Dolby Atmos 7.1.2) and intelligent channel linking, FabFilter Pro-L 2 is the complete solution for every mixing and mastering job. FabFilter Pro-L 2 features precise true peak level meters and extensive loudness meteringwith support for the EBU R128, ITU-R BS.1770-4 and ATSC A/85 standards. Combined with its unique real-time level display, you have all the information you need to achieve the best possible results. IMPROVED - Eight different limiting algorithms, all with their own character and purpose. NEW - True peak limiting. IMPROVED - Unique real-time level display with peak gain reduction labels and new innovative display modes. IMPROVED - Up to 32x linear-phase oversampling. IMPROVED - Highly accurate output and gain reduction metering including true peak metering. NEW - Extensive loudness metering with support for the EBU R128, ITU-R BS.1770-4 and ATSC A/85 standards. NEW - Surround support including Dolby Atmos 7.0.2 and 7.1.2 formats with flexible surround channel linking. NEW - Optional DC offset filter. NEW - External side chain triggering for stem mastering. NEW - Unity Gain option to easily listen to the effect of the current limiting at unity gain level. NEW - Audition Limiting option to listen to the difference between the input and output signal. Adjustable meter scale, including K-System support. Separate channel linking for both the transient and release stages. Advanced dithering with three different noise shaping algorithms. Adapts to stereo, mono and surround audio formats. Adjustable look-ahead, attack and release settings. I give a 10/10 for mixdown purposes, and that's what I use it for. The GUI is awesome and self explanatory. It gives you a very good view to what it does to the signal. But if you prefer to be not distracted by your eyes, just turn the graphic off. Pro-L gives you an input gain, turn it up, lean back and watch the cool graphics and it will limit at the ceiling you set with the out gain in the right bottom corner. It's as easy as that and works almost all the time for single channel processing. For further processing, e.g. for stereo signals, busses or even master, you can change the algorithm (called "Style"), lookahead, attack, release and how transients and release influences stereo signals (see section "Channel Linking"). Especially for mastering situations you can choose oversampling, dither, noise shaping and ISP (inter sample peaks [protection]). And if that's not enough just assign a MIDI controller to any of the parameters and tweak Pro-L for creative uses or simple automation draws. I use Pro-L for channel processing only, when the signal has a wide dynamic range and needs more than compression to bring it up in the mix. It saved my life many times.